Either that, or the bike got hit by a car. What is it with drivers this week? just snapped this shot while biking home from work today. This was on 16th between Guerrero and Dolores. I saw a classic Eddy Merckx being loaded into an ambulance today at Market/NewMontgomery around 2:30PM. Presumably its rider had already been loaded up. There were cops and a fire trunk on the scene; the cops were asking questions of a guy driving a red Firebird. Sigh. Hope the rider is OK.
eesh, look at the seat. 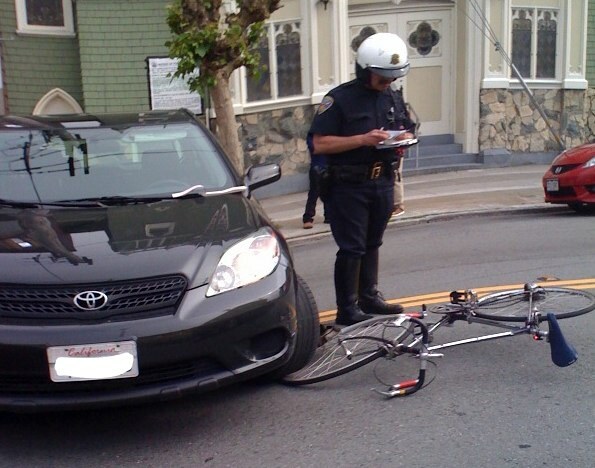 I’m guessing the bicyclist was a victim of the spontaneous u-turn. Almost completely unavoidable around here.